Artist's illustration of NASA's Juno spacecraft flying by Jupiter. NASA's Juno spacecraft has encountered its second problem at Jupiter in less than a week. The probe went into a protective "safe mode" at 1:47 a.m. EDT (0547 GMT) this morning (Oct. 19), preventing the spacecraft from gathering any data during today's highly anticipated second close flyby of the solar system's largest planet, NASA officials said. "We were still quite a ways from the planet's more intense radiation belts and magnetic fields," Nybakken added in the same statement. "The spacecraft is healthy, and we are working our standard recovery procedure." Juno went into safe mode when a "software-performance monitor" caused the probe's onboard computer to reboot, NASA officials said. 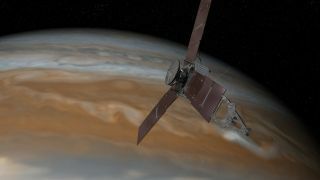 The issue is not related to an apparent problem with a set of valves in Juno's propulsion system, the officials added. The valve issue, which was publicly disclosed Friday (Oct. 14), caused Juno's handlers to postpone the spacecraft's final engine burn. The maneuver was originally scheduled to take place during today's close Jupiter flyby; it would have shifted Juno from the spacecraft's current, highly elliptical, 53-day orbit to a 14-day path — the probe's final science orbit. The earliest this burn can now be performed is Dec. 11, during Juno's next Jupiter close encounter, NASA officials have said. The $1.1 billion Juno mission launched in August 2011 and arrived at the gas giant this past July 4. Juno's main science goal involves mapping out Jupiter's internal structure, composition, gravity and magnetic fields in detail. This information should reveal key insights about how Jupiter, and the rest of the solar system, formed and evolved, mission team members have said. The original plan calls for Juno to circle Jupiter more than 30 times in the final 14-day orbit before the mission wraps up in February 2018. The spacecraft gathers most of its useful data during each orbit's close flyby; at most other times, Juno is quite far from Jupiter. Juno's first close flyby (after the July 4 orbital insertion) occurred on Aug. 27.